LandsEnd Girls Rash Guard Swim Set - Pineapple Stripe Print. I find the sizing to run small - Actual Waist on bottoms 22", Top Pit to Pit 28', Across top Waist 23". Quick to dry front-lined mock neck top with raglan armhole & Matching bottom. Preowned adorable short sleeved rash guard swimming shirt from Gymboree in a size 10. Excellent condition, barely worn. Super cute details to protect but be fashionable! Excellent condition!! 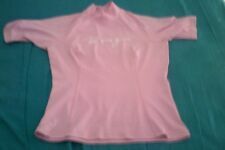 Girls GAP long sleeve swim shirt, size10. This is a Hanna Andersson Girls Rash guard or Swim Sun Shirt in Size 140 or 10. It is light pink with hearts on the front and faux ties on each side. If you look close enough it has those faded dots from chlorine but still lot of wear left! Made in Australia Alpha size 10 wet or dry swim shirt. Rash guard. Size L (10). Excellent UV protection. POPULAR RAINBOW KITTY IN FLOATIES PRINT! HANNA ANDERSSON. SUN-READY RASH GUARD. 140, US 10. Certified by OEKO-TEX® Standard 100. O'Rageous swim rash guard swim top. shoulder to hem length - 17". Very good condition. armpit to armpit - 12.5". Super cute and protective rose pink and dark purple colored rashguard shirt by NoZone. These shirts are certified UPF 50 for swimming and playing outside. 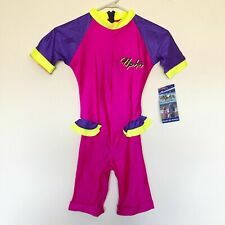 Alpha Swim Top hot pink Kids Size 10 Nwt. Condition is New with tags. Shipped with USPS First Class Package. Swim Shirt Rash Guard. Short Sleeve / Ruched Cap SLeeve. Size: Girl's Size 10 -- Made in Australia. Hand wash between uses. Chest: 28". Petite Letarte Peace sign girls rash guard with long sleeves. Size Girls 10. Submarine Deborah Soriano Swim Shirt Style 3827/062 Sz 10 Pink & Black. Rouch detail. Condition is New with tags. Shipped with USPS 1st class Mail. Top of shoulder to hem: 18.5" (front ) 21.5" (back). sleeve: 9 ". Swim Top Shirt Short Sleeve. Alpha Australia. Rash Guard. Girls size 10. Pink Purple Yellow Colorblock. STYLE:Youth Basic LS Rashguard Tee. Seamless paddle zones. We are family run and operated with only the occasional outside help. Gender/Size/Width: GIRL'S SZ 10. Hand wash and line dry. UPF 50 sun protection. NWT Pink Purple Rashguard short sleeve Swim shirt. SPF 100 UV Protection. ☑️Length: 22.5” includes the tail. ☑️Material: 84% nylon, 16% elastane. Lands End Swim Shirt Girls Starfish Peplum Rash guard Size 10 Green Pink. Condition is Pre-owned. Shipped with USPS First Class Package. Up for Consideration is a New Girls UV Protection Swim Shirt. Pink in color fits an average 10 Year Old 55", it stretches a lot. Don’t let this item slip away.